As everyone knows by now, the subject of the second International Architecture Biennale Rotterdam, which kicked off Friday a week ago, is water. Besides lectures, conferences and publications, no fewer than five main exhibitions are open. What’s on display and what can we expect? Underwater sounds are heard en route to the exhibitions at the NAi, the venue for three of the five exhibitions. Polders, the scene of land and water is an ode to the 3500 polders in the Netherlands. The exhibition highlights the design of the polder landscape. The development of ideas over time is explored in five themes and visualised using old drawings and models, made specially for the occasion, of fifteen polders, the oldest dating from 1364 and the newest from 1969, all to scale 1:10.000 and with identical legends. The exhibition also touches on how planning decisions that must be taken soon will affect the appearance of the Netherlands in the coming centuries. Or as someone put it: pump or drown? Three Bays deals with, as Biennale curator Adriaan Geuze puts it, the colonisation of water by three cities. What Tokyo, Venice and Amsterdam have in common is that they are built on shallow and sediment-rich bays. Whats more, all three boasted flourishing economies in the 16th and 17th centuries. Three guest curators were asked to select (art) objects from local archives that tell the story of four centuries of living and working with water. 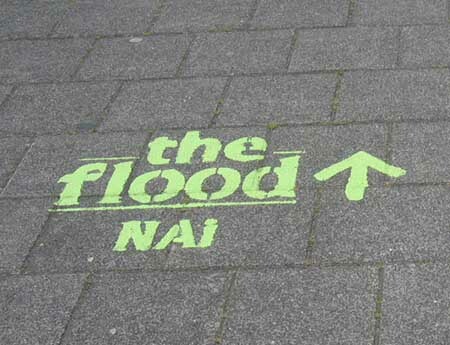 Flow, on the upper floor of the NAi, features studies, competition entries and academic design research arranged according to the way water is dealt with: sculpting with water, sculpting for water and future waters. 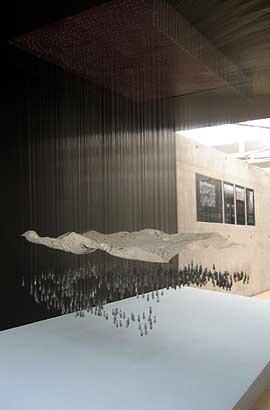 The fourth exhibition aisle hosts the results of the master class supervised by Greg Lynn, seventy young architects and architecture students studied Flood Resistant Housing. In addition to the exhibitions listed above, the Biennale includes a so-called City Programme of events at various Rotterdam institutions that address the Biennale theme in different ways. On show at V2, for example, is Splendid Immersion featuring work by four artists who study the structure of submerged waterworlds and their effect on our perception, experience of gravity, and physical movement through time and space. In the Nederlandse Fotomuseum is the exhibition Photographs of the polder. On display are pictures by Dutch photographers of the countrys polders during the years 1945-2005. Witte de With is showing Lagos Wide & Close, a DVD containing numerous video and audio layers that can be viewed and listened to simultaneously via an installation. The DVD is made up of material left over after the compilation of the documentary on Rem Koolhaass visit to Lagos (Nigeria) as part of his The Harvard Project on the City. Matton Office, ral2005 and Alterra designed and built the Suburban Ark. Floating in the water of Rijnhaven, this pontoon  according to reports it has its own water cycle, energy production, chicken coop, goat and apple tree  forms a home base for excursions, workshops, and evening presentations that highlight unpredictability, complexity and the flood. Geuze is a man with a mission, and time and again he stresses that The Flood is intended to put water on the political agenda. The diversity of projects and approaches means that no-one, and definitely not the Dutch, can afford to ignore the subject of water. And in case you didnt know, the exhibitions demonstrate that other Western countries are suffering from the same problems. How to keep out water, how channel it, how to ensure theres enough of it during periods of drought, how to cope with the demands that recreation puts on water consumption? All these issues are addressed at the Biennale. Time to head for Rotterdam. The spectacle begins even before you reach the door of Las Palmas. A big blue Flood Stairs draws visitors up the outside of the building to the third floor, the venue for two of the exhibitions. The Dutch Water City highlights the tradition of waterside buildings with more than a hundred models. Arranged thematically and chronologically, from AD 200 up to the 21st century, the exhibition charts the development of waterside buildings. Also featured are Utopian cities built on or near water, as well as models of cities in other countries, cities with links to the Netherlands, cities designed according to Dutch examples, and cities that served as examples for Dutch city fathers. 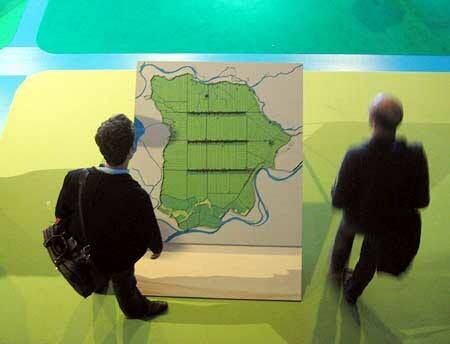 The exhibition ends with models for new water cities. Commissioned by national and local governments, architects and engineers present their ideas on water-related issues facing the Netherlands and how they need to be tackled. 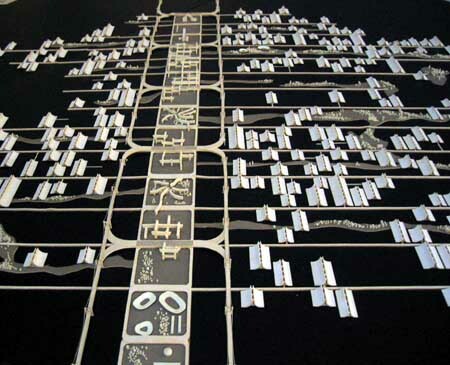 The Dutch Water City features old models, new models, abstract models, detailed models, big and small models – and that makes it also an exhibition about the model as means to (re)present the city. The second exhibition at Las Palmas is Mare Nostrum. The subject is tourism, a huge and rapidly growing industry that is colonising coastlines all over the world. Often having no relation whatsoever with the surrounding countryside, tourism usually destroys the existing nature and culture. At the same time, coastal tourism is of major economic importance as a source of income and employment. Seventeen teams from as many countries – from Mexico to Russia and from Belgium to Taiwan – were asked to analyse developments in coastal tourism in their respective countries and to come up with alternatives. The result is a motley collection of presentations that are of particular interest because of the analysis underpinning them. The alternatives will be discussed during the Mare Nostrum symposium on Saturday May 28. The results of a private session involving experts held earlier the same day will also be presented at the symposium. IABR 27 May – 26 June. Las Palmas, Wilhelminapier 66-86 open Tuesday – Sunday 11.00a.m-8.00p.m.. Exhibitions at the NAi are on show till September 4. NAi, Museumpark 25 open Tuesday – Saturday 10.00a.m.-5.00p.m. and Sunday 11.00a.m.-5p.m.